萬民英 WAN Min-Ying of 明朝 the MING Dynasty put together 《星學大成》 “The Collections of Chinese Astrology” during his leisure time and hoped that one day the book can be a masterpiece for the study of Chinese Astrology. It was a huge collection. And yet, it was difficult to understand, not just because of the subject, but, because of the confusing messages throughout the entire collection. Not until Jean Nicolas Smogolenski of the Jesuits set his foot and brought along with western astrology into China during the 16th Century, China Astrology finally found its direction for further development. 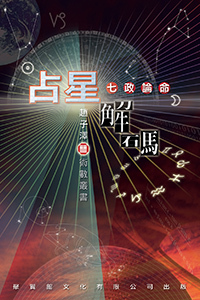 The House cusp calculation and the Natal Chart interpretation of the western astrology was first introduced by 薛鳳祚 XUE Feng-Zuo in his book titled 《天步真原．人命部》 “Fate Analysis: The Truth of Interpolation”. “Chinese Astrology – Natal Chart Analysis ” reveals the development of Chinese astrology from ancient China to modern China. It also reveals the integration of Chinese and western astrology. Describes the fundamental of ancient Chinese astrology and how does it apply to a reading using examples in the historical archives. Introducing 《星學大成》 “The Collections of Chinese Astrology”. With the aid of Ptolemy’s Tables of Essential Dignities, to clarify the definition of 廟 Domicile, 旺 Exaltation, 陷 Detriment, and 落 Fall. Introducing the House Cusp Calculation of the Regiomontanus Housing System and the clarification of the definition and use of Part of Fortune and Aspects in a Natal Chart. Introducing ancient western astrology based upon Ptolemy’s Tetrabiblos and the calculation of Primary Direction. Introducing the significant meanings of Sun, Moon and the planets and how to effective read a Natal Chart. This book is written for people who want to find the origin of Chinese Astrology and how does it evolve and integrate into western astrology.